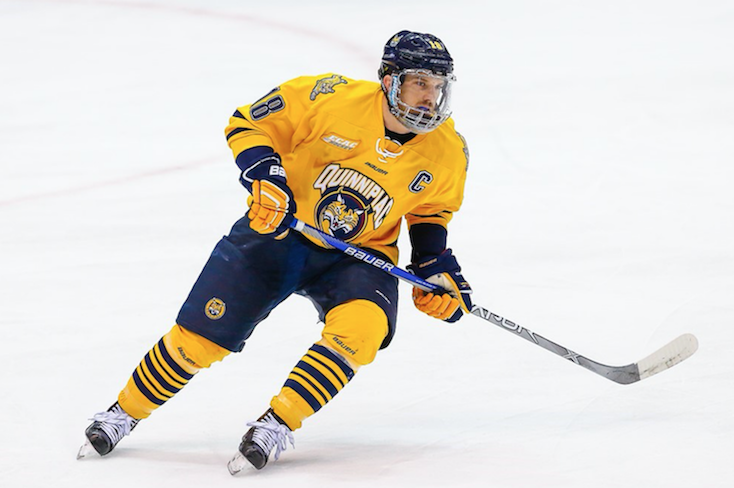 Quinnipiac and the University of Massachusetts-Lowell (UMass-Lowell) both took home victories on Saturday in the first round of the NCAA Tournament to set the stage for a showdown on Sunday night in the final game of the East Regional. How they got here: The River Hawks are coming off a 3-2-overtime victory where Joe Gambardella scored his second goal of the game to eliminate Yale. The Bobcats are coming off a 4-0 shutout of the Rochester Institute of Technology (RIT) Tigers. Goaltender Michael Garteig shined, picking up his 19th shutout of his career, tying him for fourth all time in NCAA Division I hockey with former Cornell goaltender Ben Scrivens. Previous matchups: The Bobcats and the River Hawks have skated against each other five times with the record sitting at 2-2-1. UMass-Lowell took home the first game of the series by a score of 4-1 in 2008, which sparked the Bobcats to win the following two contests. Last season, the teams met for two games with the Bobcats losing the first and tying in the second game. Brosh’s prediction: Last night, the Bobcats played two periods of some of the worst hockey I’ve seen them play all year. Still, Quinnipiac entered the third period up 1-0. It should come as no surprise this team can win in any fashion, from shutting opponents out to coming from behind. Quinnipiac never seems to lack confidence and doesn’t normally panic when things aren’t going right. At this point in the season, those are very important abilities to have harnessed. UMass-Lowell has some serious size, but Quinnipiac has battled larger opponents all season. Quinnipiac punches its ticket to the Frozen Four, 4-2. Cloutier’s predictions: Quinnipiac has allowed only 22 goals through 40 games after the second period, but the issue lies in the first period. Against Harvard in the ECAC final, the Bobcats were outplayed going into the first intermission and the same goes for their NCAA first round matchup against RIT. I predict that the Bobcats realize this issue and come out flying early on. Look for the Soren Jonzzon/Tim Clifton/Scott Davidson line to start the game against UMass-Lowell with a quick dump-and-chase into the offensive zone, leading to some big hits early on. Whether or not these big hits are clean will be an important factor. Since this game will be more reflective of Hockey East’s aggressive style with checking and after-the-whistle extracurricular activity, both of these teams need to stay out of the penalty box to win this game. The team that can stay out of the box and avoid the muck will emerge victorious. Since the start of the 2012-2013 season the Bobcats have the most wins of any school in NCAA men’s ice hockey. I expect them to extend that lead with a win that sends them to the Frozen Four. Brosh’s player(s) to watch: For the Bobcats, they will have to rely on their freshmen tonight more than ever. The line of Tim Clifton, Jonzzon, and Davidson has become a standout trio for the Bobcats, battling up against opponents’ top lines. Davidson is one of the main reasons for that success as he tallied another goal last night. To go along with that, Quinnipiac freshman Chase Priskie continues to be an offensive threat whenever he is on the ice paired with Connor Clifton. The Bobcats have relied heavily on their freshmen all season and tonight is no different. Cloutier’s player(s) to watch: For UMass-Lowell to win this game, they’ll need Dylan Zink to play outstandingly. No. 25 for the River Hawks is an offensive defenseman that is no stranger to scoring goals as he has 10 on the year. Zink runs the power play and is a focal point in all three zones. While he may be an offensive defenseman, he is tied for the team lead in blocked shots. If the Bobcats want to win, they need to avoid Zink’s shin pads so no odd-man rushes form for the River Hawks. For the Bobcats, I’m going to have my eyes on the Clifton brothers. The first reason is because they have been playing the best hockey of their careers this season. Connor Clifton has matured immensely this year as he’s no longer head hunting opponents in the neutral zone (although he still imposes a physical style). The Clifton brothers need to prove the maturation once again in this one because Hockey East teams will do everything they can to get under your skin and send you to the box. With Sam Anas not completely healthy, Tim Clifton must become more of scoring threat in this one, and expect him too. If the brothers can stay out of the muck and keep their heads in the game then the Bobcats will head to Tampa for a shot at the national championship.